Any deposit amount paid direct or with any third party partner is non refundable. If you cancel your booking with less than 24 hours prior to your arrival your credit card will be charged for the full amount of your reservation. Cancellations with more than 24 hours notice will not be charged, although any deposit amount paid will not be returned. Valid Passport and Visa are required at check-in. Photocopies are not accepted. Cash only - Top Banana only accepts cash payments. Credit cards are only needed to guarantee your booking. Deposits - We ask our guests a deposit for room keys and also towels (available upon request) as a simple measure to ensure their return. Deposits are fully refunded when those items are returned to us when checking out. Note: Breakfast is available at the restaurant but not included in the room rate. A legend in it's own right, Top Banana Guesthouse on street 278 sits snugly in the heart of the city offering a safe and comfortable environment for our guests. Check out our great rates, tasty food and kicking bar at one of the longest established backpackers guesthouse bar and restaurant. 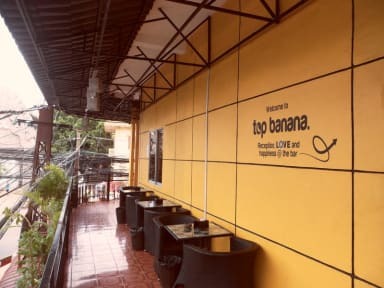 Top Banana has been operating for 17 years and has become one of the most popular places for travelers and expats alike. Come find out what all the fuss is about. We have free Wi-Fi that extends to the rooms and our rooftop restaurant and bar serves a range of Khmer and international dishes, as well as a vast drinks menu. 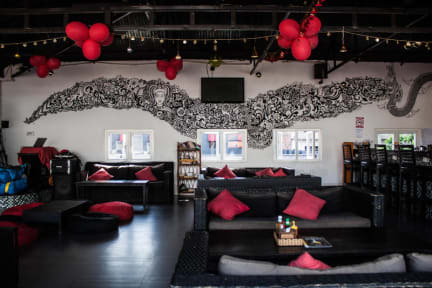 The cool rooftop chill out area in the day becomes a bustling bar at night with some live music and other events to entertain our guests. The dorm rooms have lockers and shared bathroom facilities along with a/c and large single beds. The private rooms available have en-suite bathroom and with a/c options. Our guests have access to the next door neighbor's swimming pool, provided they use their bar / restaurant facilities. Airport / bus transfers and day trips can be arranged at the tour desk along with visa's for your onward trip.